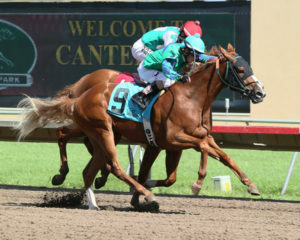 Hot Shot Kid and jockey Alex Canchari won the $85,000 Minnesota Derby on Saturday at Canterbury Park after responding gamely to a challenge in deep stretch from Got Even Smarter and Orlando Mojica. 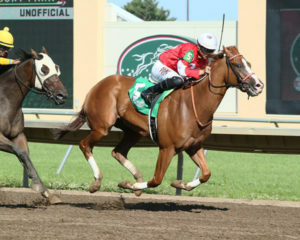 The 3-year-old Minnesota-bred gelding by Majestic Warrior, who has now won five consecutive races, is owned and was bred by Warren Bush and is trained by Mac Robertson. Canchari settled Hot Shot Kid behind the front-running Sizzler on the backstretch before taking command on the far turn and into the stretch. Mojica and Got Even Smarter charged at the leader in mid-stretch, nearly reaching even terms with Hot Shot Kid. Canchari asked for run and prevailed by 3/4 of a length. Final time for the 1 mile 70 yards was 1:42.91. Hot Shot Kid returned $2.40 to win. Fireman Oscar finished third. The $85,000 Minnesota Oaks went to runaway winner Double Bee Sting and jockey Jareth Loveberry. The 3-year-old filly by Stay Thirsty surged to the lead on the far turn and won as she pleased, drawing off to a six-length victory over Two Be Royal in 1:43.54 for 1 mile 70 yards. The favorite returned $4.00. She is owned by her breeder Curtis Sampson and is trained by Tony Rengstorf. Earlier on the 10-race card Familiar Rhythm won the $40,000 MTA Sales Graduate Futurity for owner Dale Schenian. The 2-year-old gelding was ridden by Quincy Hamilton and is trained by Francisco Bravo. 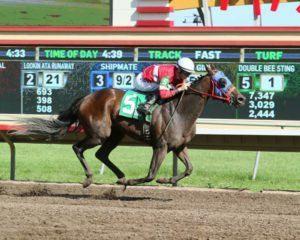 The gelded son of Algorithms earned $24,000 for winning his racing debut and earned back much of his $34,000 purchase price at last year’s MTA Yearling Sale when Shenian bought the Minnesota-bred from the consignment of Wood-Mere Farm. The gelding was bred by Jeff Kerber. A crowd of 20,605 turned out for the races and Corgi Dog and Cupcake Festival. This was the second largest attendance in Canterbury Park history.